← OMG! Is this the Anybots QB at one-tenth the price?!? As I have been reporting from here, the InnoRobo conference was quite an eclectic group of companies – coming from France, South Korea and Japan. Yes, iRobot was there as an exhibit presenter, but most of the US robotics companies were definitely in absence. I spent a great deal of time roaming the booths in the exhibit hall at the largess of Jean-Christophe from GOSTAI (he got me a complimentary pass to the event). I was looking forward to seeing JC and the updated Jazz, after my first experience with it two months ago. And, while GOSTAI has not released their new user interface, the redesigned Jazz has a lot of physical and component improvements. When I used the Jazz last, the RF and the physical sound of the motors that supported head movement were incredibly distracting in conversations. With the improvements of the mic and speaker placement, the sound was immensely better. And, unfortunately, the new pilot interface is not ready for prime-time, but I look forward with anticipation to see it in operation. The Jazz telepresence prototype was also on display and I got to navigate around, but I was kind of disappointed with the size of the screen and the video quality of my representation on the Jazz. But then again, I am a fan of a 15″ monitor from the Texai. On YouTube, someone mentioned that I had not captured any visuals of the Jazz. So, in an act of responsible reporting, I am including GOSTAI‘s video on InnoRobo – which includes additional footage of players at the event. Enjoy – and send your regards to JC at GOSTAI. 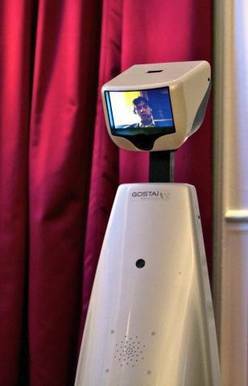 This entry was posted in Events, GOSTAI, InnoRobo, Jazz Connect, Remote Presence Systems, RPS Companies and tagged GOSTAI, InnoRobo, Jazz, robot telepresence. Bookmark the permalink.